I don't have much in my pipeline now, and since I have plenty of time, I thought, why not make a lager. 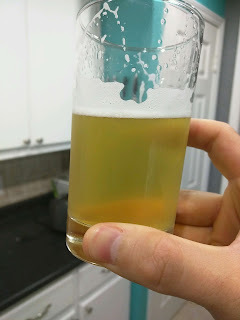 I decided on a munich helles as the style; a fairly simple recipe based of of Brulospher's recipe here: http://brulosophy.com/recipes/munich-helles/ and lagered roughly according to the quick lager method detailed here: http://brulosophy.com/methods/lager-method/ . It's still hot out, so it should make for a very refreshing beverage for hot days. Treat 3.25 gallons of softened tap water with 1/2 campden tablet. Rehydrate the yeast in warm water per instructions. Once wort has cooled reasonably, add the yeast and aerate well with immersion blender. Ferment starting at 55F and ramp according to the Brulosophy quick lager schedule. 8/6/2016: Brew day. Using my new kettle koozy to help with heat retention. Heated to roughly 155F before adding the grain. Seem to have nailed the mash temperature. Using S-23 lager yeast today because the LHBS didn't have any W-34/70. Gravity going into the boil is 11 brix. After the boil, cooling, and topping off, gravity was about 1.048. Aerated and pitched 1 packet of rehydrated yeast. Setpoint on temperature control set to 55F. Thermometer reads 77F. 8/9/2016: Checked gravity, looks like it was about 1.04. Hard to tell with the relatively thin foam cap. 8/10/2016: gravity is around 1.034. going to give it until tomorrow morning or so to before ramping the temperature. 8/11/2016:. Put the setpoint to 65F in the morning. 8/12/2016: gravity is about 1.016. no off flavors in the drop or so that was on the hydrometer. 8/20/2016: gravity is about 1.01. cold crashed with gelatin. kegged around this time. Force carbed for 12 hours. Left in the keezer at 40F. Color is very light. It's the lightest beer I have made I think. Slight haze, most of what is in the picture is from condensation. Smell is slightly fruitly. None of the chunky smell present at kegging is left. Very slight mustiness. Taste is also slightly fruity. A slight yeast unless is present too. Quite refreshing. Might have a touch of green apple flavor. No butteriness. Very light on the tongue. Slight astringency. Overall it is very tasty for a first lager. Not sure what I would do differently. Next time I might leave it at room temperature for an extra day or so, just to be sure everything is cleaned up.